A pictoral guide on how an aquatic planting terrace is put in place. 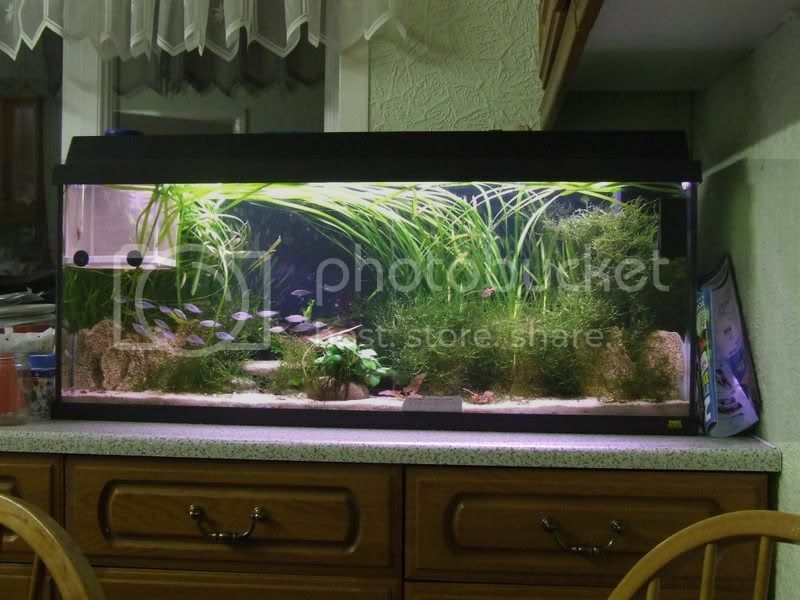 This article is a step by step as to how I created my own terraced planted aquarium and will be added to as it grows in etc over time. 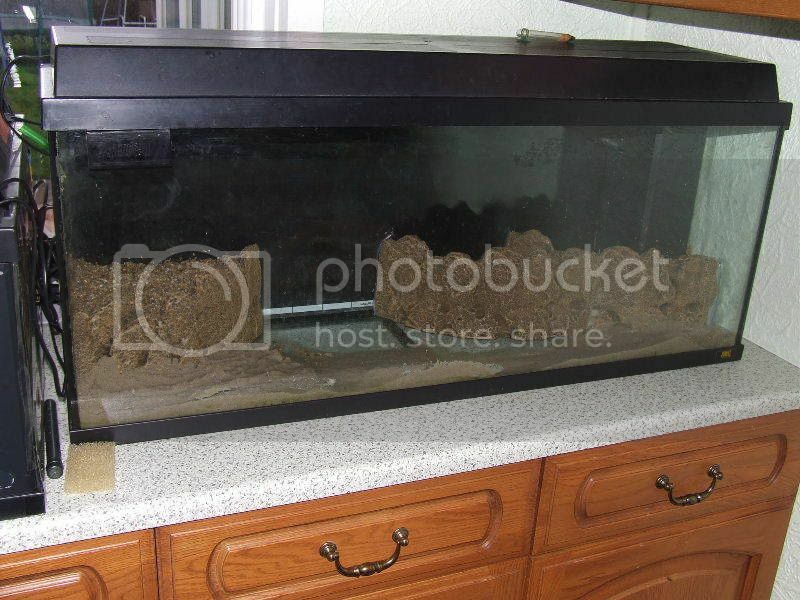 First of all you will need an empty tank, like below. 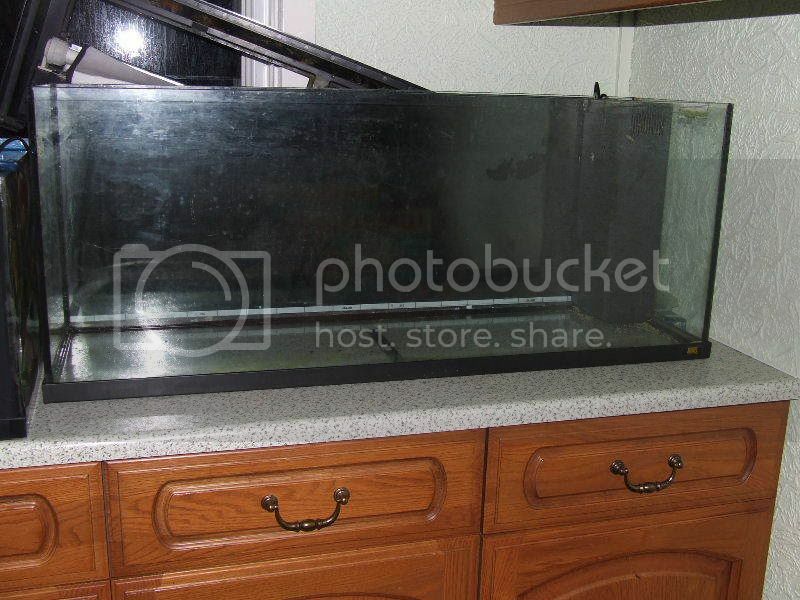 This is my old rekord 120 that was used until a few days before for Tanganyikan fish and some shell dwellers, the media was kept mature in a separate tank that the fish were put in. Secondly, we need to see where we want to place the terraces, you can build your own, or do it the easy way and buy some of these plastic Juwel terraces which are great IMO as you don?t have to put up with filter floss showing through eventually. Many terraces that are created by building a wall from rock or slate and then lined with filter floss to prevent the terraces substrate seeping through the gaps into the foreground, but after a period of time the top rim of filter floss tends to show through as the substrate moves and it lifts up. 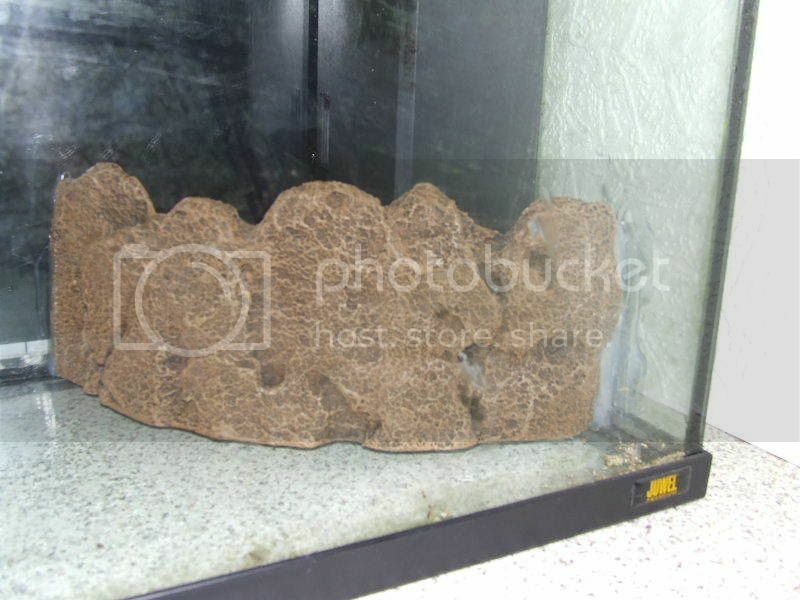 As can be seen on this close up, I siliconed them into place with aquarium silicone as I didn?t want gravel falling out of the gap between them and the glass. Next you can start adding your substrate. I have opted for sand at the front since it?s visually more pleasing to me, plus some fish prefer sand. I am planting the terraces and prefer to do this in a very fine pea gravel, so I have filled them to the brim with this substrate. Fertilisation is provided by a pond fertiliser stick in the middle of each (the LFS had none of the tank sticks that last 12 months, just 3 month tablets that I dislike personally) so should last for at least 18 months IMO. 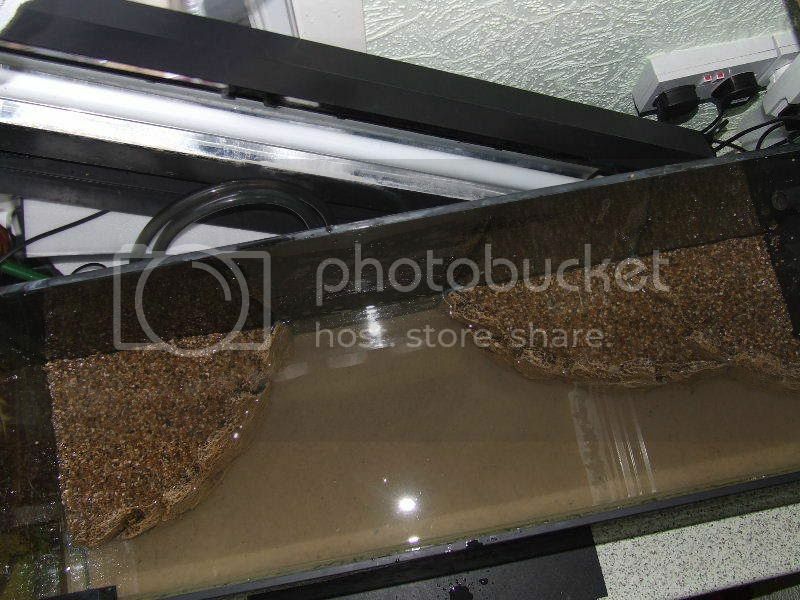 You can add things like Laterite, potting soil without chemicals added (John Innes no.2 is very good) but as this is a low tech tank these types of fertilisation would be a bit much for my plants, so just wasn?t worth the cost of buying/getting them. Next add some water to begin the planting of the lower level, or if you wish cover the terraces in java moss, as I have done to hopefully cover it to give a moss wall effect which should look cool once its grown and attached. As you can see this is the layout from above. Next fill the water level higher and plant out the terrace (s) whilst it?s ¾ full in my case so as to allow you to move about without splashing out water everywhere. Unfortunately I couldn?t plant it out as my LFS hadn?t had their plant delivery in due to the holiday period so I had to wait a day, but got it filled and running to clear it, get the water heated up more, filter media in and the 8 adult amano shrimp I had retained for this tank. So the next day I got my first fish to keep the filter going, 12 dwarf neon rainbows at about an inch long. All settled in fine and shoal really well, which is encouraging to see. The following day I got my plants and my final stock for now (which were floating in this picture) so here it is 4 days after I began (thanks to holiday delays) all planted up and stocked on the 4th of January 2008. The final stock that I added was a baby Ancistrus and a brown ghost/African knife fish. The plants that are currently in the tank are comprised of Vallis as a background plant and Amazon swords within the terraces as they do best with root fertilisation IME and will provide lots of cover for the fish. There is an Anubias attached to a pebble from the previous tank that I just couldn?t throw away so I placed it in the tank around the area that the knife fish will hide (centre of tank). 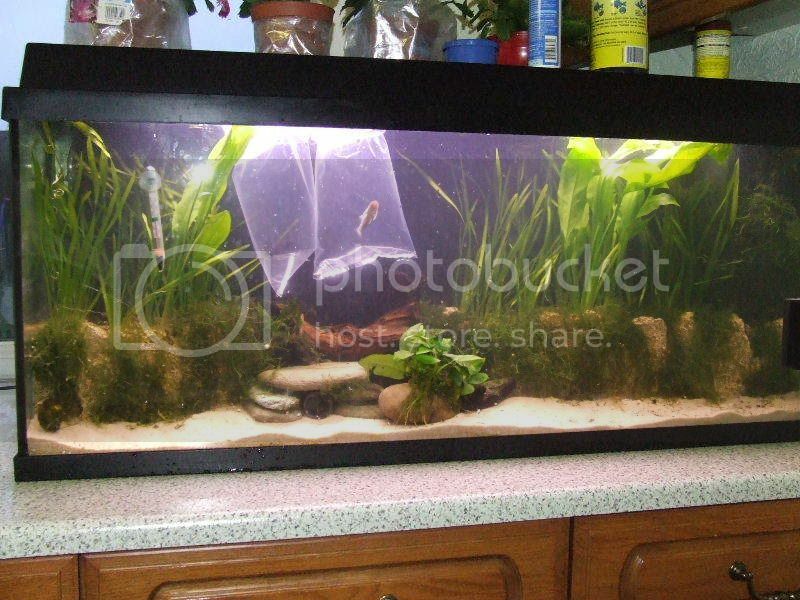 There is also java moss as mentioned and little bits of java fern attached to the pieces of bogwood in the tank, one also has pieces of moss ball growing over it, but that was more accidental than deliberate to be honest. I am contemplating adding some low growing foreground plants such as dwarf chain sword, but I shall wait to see how well the tank does without it as I have quite low lighting levels. 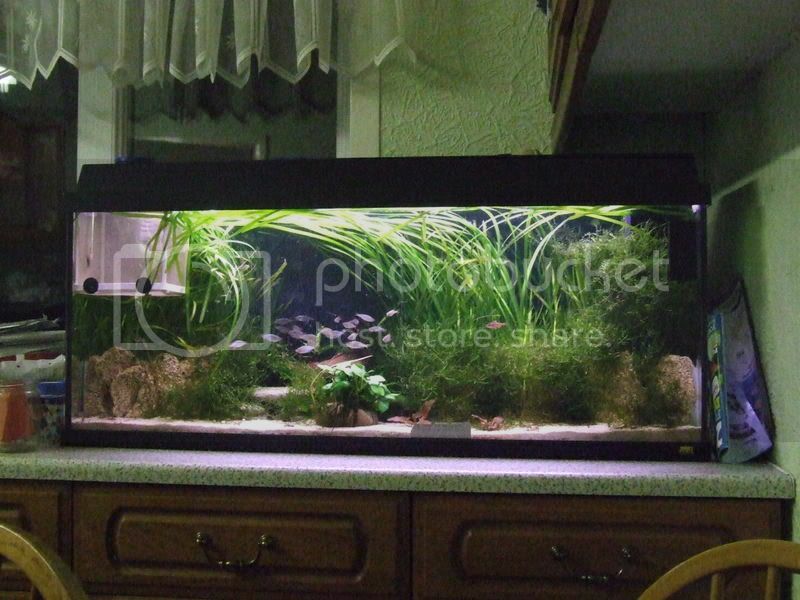 Some corydoras may be added such as panda, adolfoi or sterbai to help keep the substrate turned over. Fantastic Aquarium and great article. We're now looking at ways to incorporate a similar planted terrace to our tank as we have sand for our catfish and currently potting our plants in gravel. Nice article and a good looking tank. Those juwel terrace pieces are fairly new aren't they? That's nice. I haven't seen those juwel bits before either. The tank looks really nice I'd wanted to do something like that in my new tank I should be getting in the next few weeks. Quick question. Are the terrace peices easy to get hold of or are they something that would need to be ordered off the net? 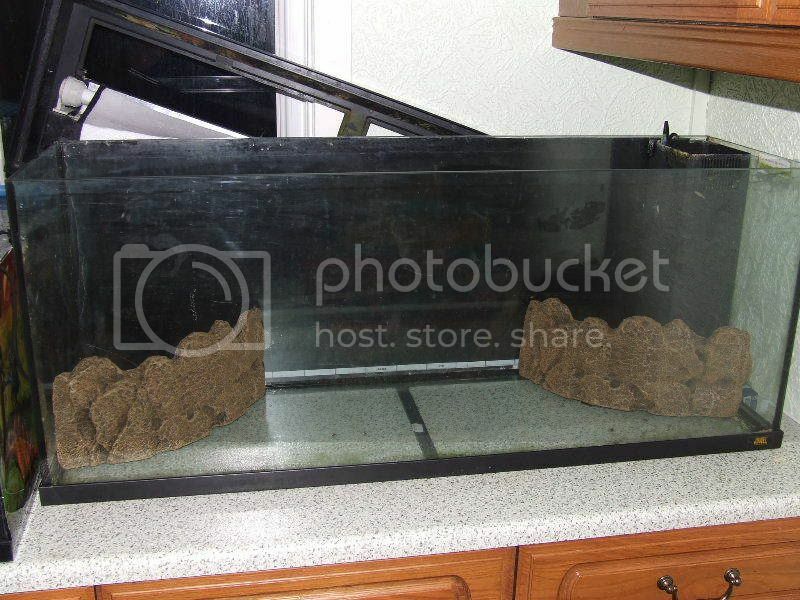 This might be nothing, but dosen't the substrate in the terraces get drawn int the lower end of the juwel filter? just wondering what is that really long thin plant called? kcon it is vallis, most fish stores will have it for sale. Hi, I'm fairly new to the fish thing. I moved into a new house and the previous tenants had kindly left a little fantail goldfish in a filthy plastic bowl behind. 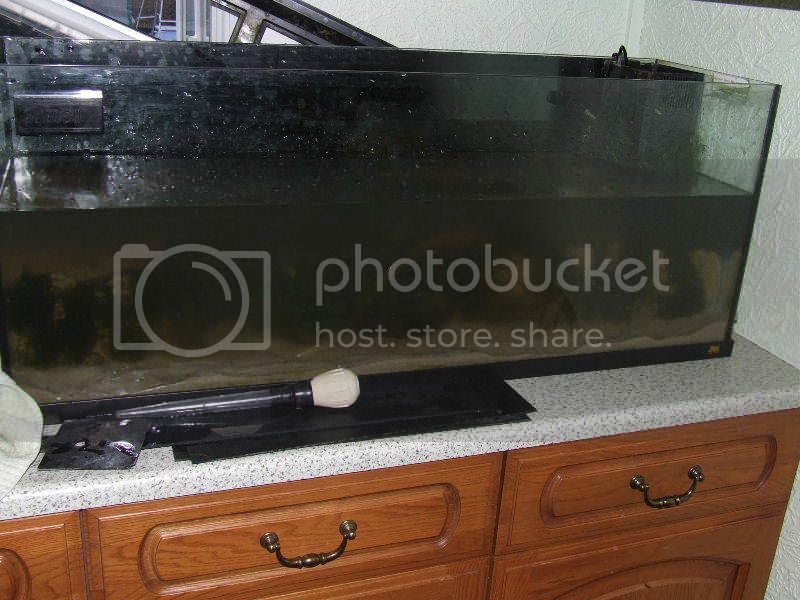 I managed to get a larger tank for him thank goodness!!! and some friends and my husband and I are now very into our tank. its not massive 2 foot half hexagon with a filter. I have just today managed to murder my 2 weather loaches during a water change - don't really understand how to be honest but i assume it was either stress or me messing too much with the bacteria etc. you live and learn. Hi nookybear - welcome to FK Sorry for the delay in replying to this! 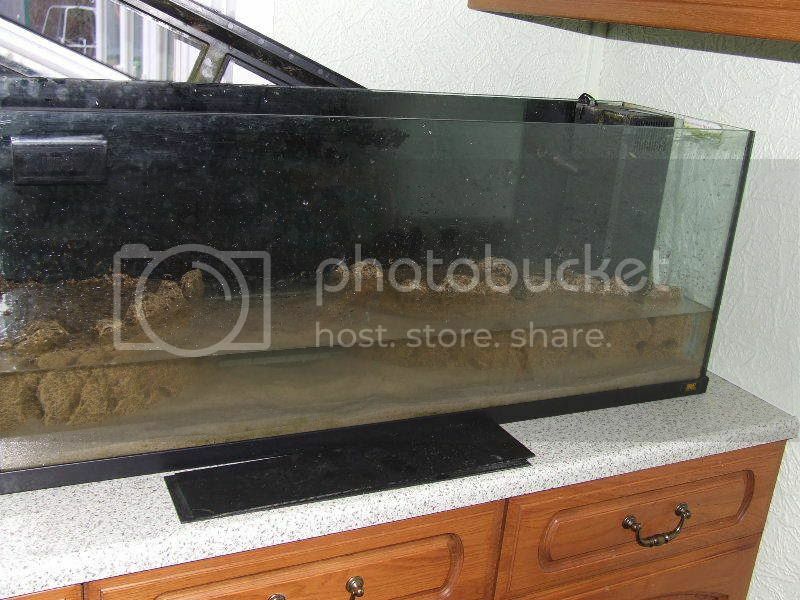 Well done for helping out your unexpected guest Some people can be so mean Anyway, yes you can use sand in an aquarium for goldies although some people say it can irritate their gills where they are forever rootling around in it. I've got very fine quartz gravel in mine, it's almost sand but not quite that fine. It's mixed with some small pea gravel but only because I had tonnes of the stuff already! Thanks for the demo, it inspired me. I noticed the last update is in '09... Any updates? 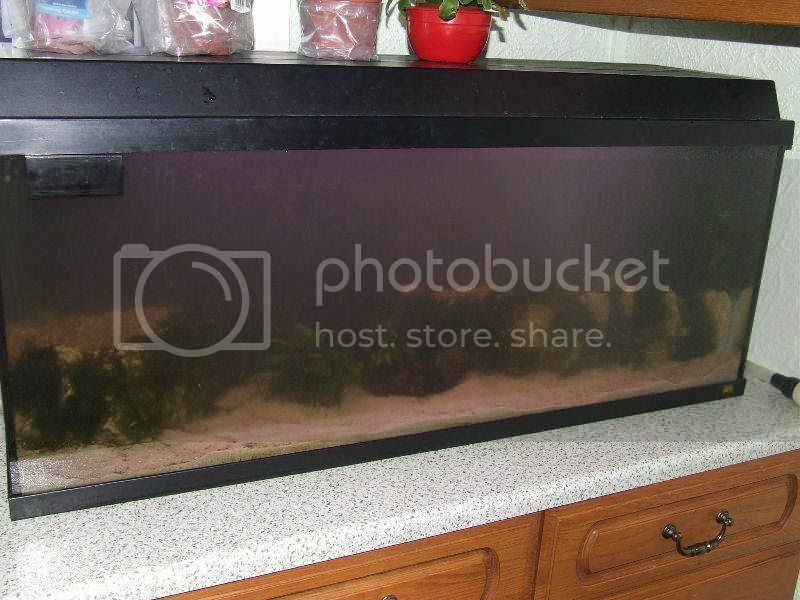 Either way, the tank looks very nice... Hope your able to keep it up.